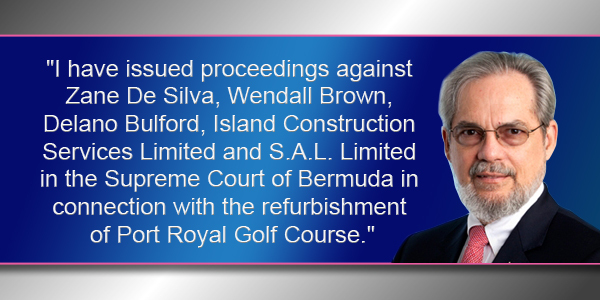 [Updated] On behalf of the Government, I have issued proceedings against Zane DeSilva, Wendall Brown, Delano Bulford, Island Construction and S.A.L in the Supreme Court of Bermuda “in connection with the refurbishment of Port Royal Golf Course,” Attorney General Trevor Moniz said. The statement from Attorney General Moniz said, “On behalf of the Government of Bermuda, I have issued proceedings against Zane De Silva, Wendall Brown, Delano Bulford, Island Construction Services Limited and S.A.L. Limited in the Supreme Court of Bermuda in connection with the refurbishment of Port Royal Golf Course between 2007 and 2009. “Following the publication of the Special Report of the Auditor General on the Port Royal Golf Course Improvements Capital Development Project in October 2014, I commenced an internal investigation into the matters noted in that report, in particular, the finding of self-dealing by trustees. “Trustees owe fiduciary duties to Government. As part of the refurbishment, goods and/or services were supplied to the Port Royal Project by companies linked to the first three defendants – all former trustees. “At no point did they properly declare their interests or recuse themselves from the Board’s decision-making in respect of the refurbishment of Port Royal. “Accordingly, Government is entitled to any profits made from these arrangements, and to obtain any secret commissions earned.